Can you describe what you mean when you say “Color-coded ls output can cause permissions errors in some circumstances”? In what way would the output of ls cause permissions problems? I was wondering exactly the same as Cloned Milkmen. During my 11 years of using Linux I have never come across such an issue. Thanks for asking. I was hoping someone would. In CentOS, if you copy the file /etc/DIR_COLORS to your home directory as ~/.dir_colors, and if you change the line with “COLOR tty” to “COLOR none”, then all your login sessions become color-free. Was looking for a solution to this color mess. I can’t bear bright colors due to eye problems. Hence, the desperate need to de-colorify the terminal o/p. Why do you guys hate colors so much? Colors are what makes life vibrant. I execute “unalias ls” in my profile. ls is aliased to “ls –color=tty”. That takes care of the color issue. The reason why I don’t use the color is that I have problems with my vision and need high contrast like white on black. So, on a color listing, I can’t see the dark blue against a black background. Thank you. I just installed Ubuntu 8.04.1 and it was extremely annoying. Defaulted to light pastels on a white background, and worse, for some directories it was dark green text on a slightly darker green background making it literally illegible. If the defaults were sane colors I could have lived with them, but I have better things to do with my time than editing color codes for ls. why to bother about alias. just type simple command – dir. it doesn’t display color. it function same like ls but without colors. it works for me. some system doesn’t support that. 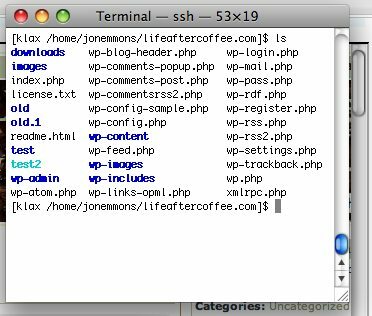 ksh or zsh & set -o vi & export EDITOR=vi into your login rc file and you’ll end up with a non-broken working environment. most of the time i’m also too lazy to set this up though. but it’s really not worth your time to work around all these little details each and every day, rather get rid of them from the start. It will cost you a few of those “clever” features and you’ll have a 5% lower risk of cardial arrest. Next Next post: Oracle Shell Scripting Now Available!